Raleigh, North Carolina, United States, April 6, 2018 – We are rapidly expanding our ambitions of thinking globally and acting locally. We can accomplish this with our growing DASA Ambassador Program. 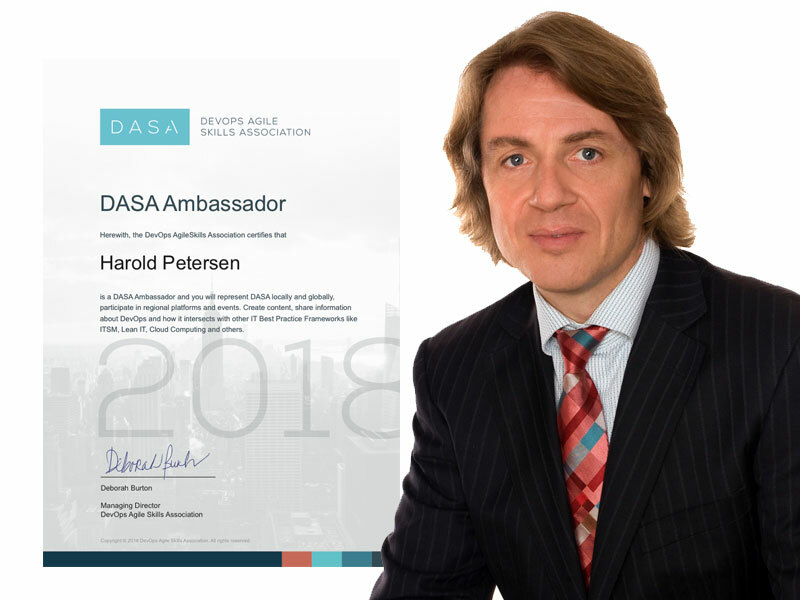 It is with pleasure that I announce Harold Petersen as our new DASA Ambassador in Australia. Harold has such rich and relevant experience in the IT Best Practice Management space. He is Practice Director and Lead Consultant at Servicevalue, a service management, digital transformation, and cyber security consultancy company. With 25+ years experience, specializing in the areas of Digital Strategy, DevOps, SIAM, ITSM, ICT Governance, Information Security Governance and more. He was itSMF Australia and itSMF Singapore national council member and itSMFI-IEB director and is a regular speaker at itSMF, PMI, and ISACA. We are rapidly expanding our ambitions of thinking globally and acting locally. We can accomplish this with our growing DASA Ambassador Program. We know his in-depth knowledge, and intimate understanding of the unique characteristics that make up the Australian market will allow DASA to expand our mission of providing an opensource, community-driven DevOps Framework for IT professionals and teams that are intent on transforming their business to support new digital business models. Which requires that they embrace the new IT way of working with DevOps. Our global Ambassadors represent DASA locally and globally, they participate in local and regional events as well as (online) platforms to help create content, share information about DevOps and how it intersects with other IT Best Practice Frameworks like ITSM, Lean IT, Cloud Computing. Our select group of DASA Ambassadors helps to spread the word about how the DASA DevOps Competence Model, Maturity model, and Certification scheme provides IT Professionals and Teams the skills and knowledge needed to address cultural and organizational issues to deploy DevOps successfully.